Nothing says manliness like grilling some juicy steaks outside in the fresh air. One could argue there isn’t anything manlier, but that’s not true. 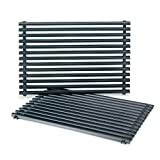 You can make your own grill grates for your grill and up the macho factor even more! These ten tutorials will teach you how to make a DIY grill grate that you’ll be pleased to grill your favorite foods on. This heavy-duty custom DIY grill grate tutorial is an impressive project to undertake. It uses 3/8″ steel bars and laser cut letters to create a sturdy, personalized grill grate. Use your name or a favorite word to customize your grill grate! Moreover, remember to brush up on your welding skills before beginning this project. 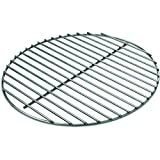 If welding intimidates you or if you just don’t want to invest in the equipment, start with a simple grill grate basket. You won’t need any machinery except an angle grinder, and this project is easy enough for a cautious beginner. For other outdoor projects, you can also try a DIY fire pit. This DIY grill grate project is simple to make thanks to a plasma cutter. Just draw out your grates and any custom design on a 1/8″ sheet of stainless steel and cut with the plasma cutter. Finish off the edges with a grinder and you’re ready to grill! You don’t need many skills or much time to make your own raised smoking grates for your gas grill. Just follow the tutorial below, which calls for minimal supplies, and you’ll be ready to smoke some meat in just a few minutes. This raised grate would also be ideal for grilling hot dogs since you don’t want them to be directly over the heat! If you need a smoker or grill and don’t want to purchase a pricey one, you can make this flower pot grill for a decent price. Clay flower pots are used to insulate the grill, and you’ll use grill gaskets to ensure a tight seal for maximum smoky flavor and temperature control. Watch the video below to learn how to make this DIY grill. 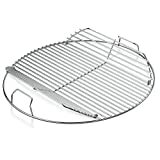 Never fear of camping without a grill again with this easy but handy campfire tripod grill. All it takes is three bars of stainless steel, some chain, and a grill grate! Some welding is involved in this project, but there are ways around welding if you don’t have one. If you have access to a welder, you can make this DIY grill grate for about $7! The project uses super heavy duty steel to make a grill grate that will last for a very long time. Although the welding process can be a little tedious, your efforts will be well worth the time. This video is a good tutorial for a basic DIY grill grate. It involves welding stainless steel rods and end bars together to create a nice, sturdy grill grate. Everything is smoothed off with a grinder and wire wheel. This project can be customized to fit your grill’s dimensions, or you can keep watching the video to build your own grill, too. This small DIY grill grate is the perfect size for a hibachi grill or for grilling on your outdoor tabletop. You’ll need some specialized tools to build this, but the final product is impressive! Follow the tutorial below to learn how to make this grill grate. Take your grilling experience to the next level by building a miniature Parrilla grill grate! The angled grates catch grease and reduce the amount of grease fire flare-ups you would typically get while grilling meat. 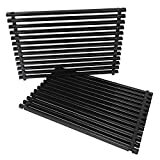 The builder in this video 3-D prints a spacer to keep his grates even, but you can just use a yardstick and Sharpie to mark off each grate if you don’t have one. This kamado grill will help you make yourself the juiciest of stakes, below you have the tools and items you need to complete this project, and in the video tutorial the steps you need to take. Make sure you drill as instructed in order to get the desired project, good luck! Building your own DIY grill grate has a lot of advantages. If you already have a welder and angle grinder, your grate will be much cheaper than replacements you can find at home improvement stores. Your grill grate will also be a lot sturdier, and you’ll be able to brag to all your friends while you’re grilling up some burgers! Have you built a DIY grill grate? Share your thoughts and tips below!